In the Emperor’s New Clothes, it tells of a story of courtly pride and intellectual vanity. With the emperor pursuing after worldly standards, seeking to be validated by his people while at the same time, his people are also pretentious in nature by not defying his baseless statements. This piece speaks about the conformity of the general public to authority, the fear of speaking out in order to be different. Instead of using embossing, which is found in Braille, a hole punching technique is used to create a similar tactile effect that only allows one to see it when they are up-close. It expresses how humans are generally short-sighted, to judge purely based on appearances. The banner also emphasises emptiness, the nakedness the emperor is when he paraded around in his glorious clothes. A plastic transparent plastic bag is scanned and with the light of the scanner forming streaks of light. The scans are then vectorised for the banner print and then punched individually. The banner is 2.5m in height and 0.30 in width. Vectors are also overlaid in for the video. Placed against the light, and with the rest of the banners, it is empty, but it is not. 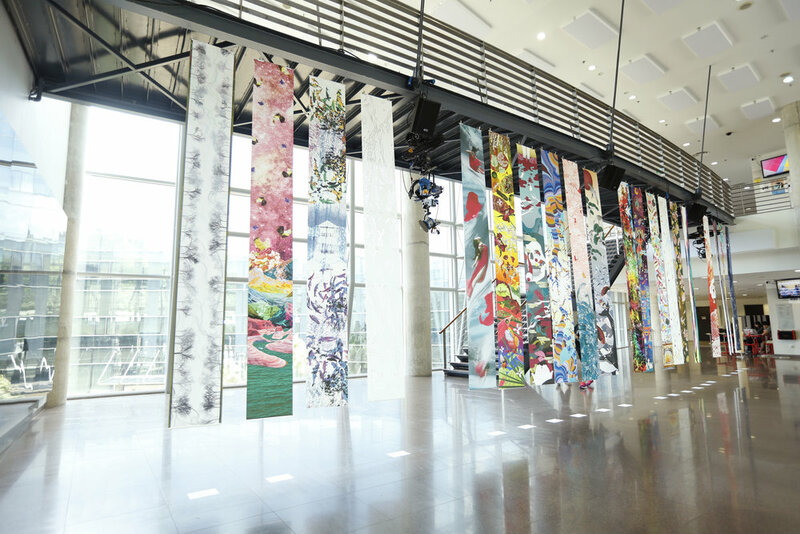 Banners are showcased in the lobby of School of Art, Design and Media, Nanyang Technological University. Blind is a Pattern Banner making project taken under DV2011, Technology Art in Fashion in Nanyang Technological University, School of Art, Design and Media with Ina Conradi-Chavez.